New Delhi, Nov 2: Double centuries from Cheteshwar Pujara (Saurashtra) and Mayank Agarwal (Karnataka) in their respective matches was the highlight of the second day of the fourth round of the Ranji Trophy cricket tournament on Thursday. 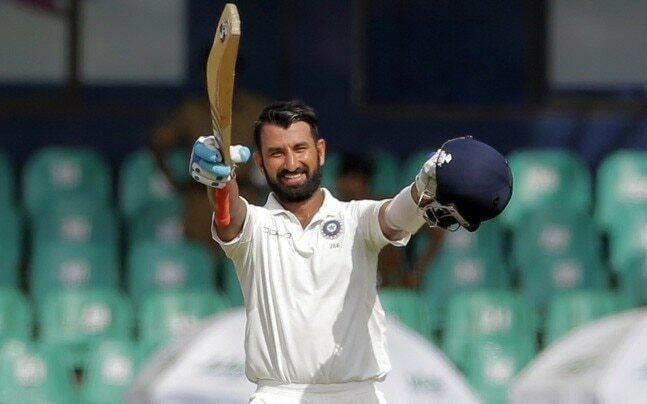 Placed on top of Group B, Saurashtra rode on Pujara's record 12th First Class double ton, the most by an Indian, to pose a mammoth 553/9 declared against Jharkhand at the Madhavrao Scindia Cricket Ground in Rajkot. Pujara's 204 came off 355 deliveries, including 28 fours while Chirag Jani also contributed with a century, scoring 108 to help the hosts reach a commanding position. In reply, the tourists finished the day at 52/2. In Group A, Mayank Agarwal remained unbeaten on 219 to help Karnataka post a stiff 461/2 in reply to Maharashtra's first innings score of 245. Mayank forged a 259-run opening stand with centurion Ravikumar Samarth (129) before joining hands with Karun Nair (56 not out) to see off the day undivided at the Maharashtra Cricket Association Stadium in Pune. In another Group A fixure, Hyderabad put up a challenging 474/9 declared against the Railways at the Karnail Singh Stadium here. Skipper Ambati Rayudu's (112) century powered Hyderabad to get past 400 and put up a solid first-innings total before they restricted the Railways at 35/1 at stumps. The other Group A match at the Palam A Ground witnessed a close contest Delhi and Uttar Pradesh. Gautam Gambhir led from the front with his 86 while Dhruv Shorey remained unbeaten at 65 as Delhi reached 228/6 in reply to UP's 291 at stumps. In Group C, Mumbai took a strong 202-run lead over Odisha at the KIIT Stadium in Bhuvneshwar. Mumbai reached 58/3 in their second innings after bundling out the hosts for a meagre 145. The tourists had earlier made 289 in their first essay. In Group D, Himachal Pradesh were tottering at 163/5 in response to Bengal's massive 419 at the Eden Gardens in Kolkata. For the hosts, opener Abhishek Raman (176) and skipper Manoj Tiwary (123) were the major contributors. In another Group D match, hosts Chhattisgarh are on the back foot against Punjab at Raipur. After being dismissed for 238, Chhattisgarh bowlers had no response to Anmolpreet Singh (171 not out) and Gurkeerat Singh Mann (111), who took the tourists to 481/6 at stumps. Both men got to their hundreds with strike rates in excess of 90. Opener Jiwanjot Singh's 75 added to Chhattisgarh's miseries as Punjab lead by a whopping 243 runs.